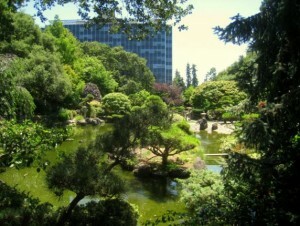 San Mateo is a city approximately 25 minutes from San Francisco and 30 minutes from San Jose. It also happens to be one of the larger San Francisco Peninsula suburbs. 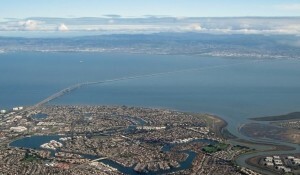 Located in the high-tech Silicon Valley, the 2010 United States Census reported that it had a population over 97,000. The estimate in 2014 was 102,893 as more and more prospective residents realize that living in such a special area has unique and enjoyable aspects that separate this city from the rest. Downtown San Mateo is a spectacle to see. One of the more developed areas in all of San Mateo County, the suburban downtown has hundreds and hundreds of local shops and restaurants. There is a large Japanese population in San Mateo and as a result there are many Japanese style stores and restaurants scattered throughout the city. There is even an authentic Japanese Tea Garden located in Central Park. An absolute must-see. This small but elegant and well-maintained Japanese tea garden is located in Central Park, which is positioned right in the heart of the busy. There is no admission charge and you can walk around leisurely and look at the blooming cherry blossoms, the beautiful landscaping design, large Koi fishpond, bamboo grove, gazebos, and the popular granite pagoda. This Japanese Garden is the ideal if you’re looking for a peaceful place to meditate or simply appreciate the beauty of nature. One of my best friends used to frequent this garden two or three times a week. He now owns a tree business in Las Vegas and has a deep passion for Japanese Gardens. His name is Misha and you can contact him here, Las Vegas Best Tree Service. He would be glad to talk to you about the spiritual and cultural history surrounding these living pieces of art. I have listed some special events that are exclusive to San Mateo and it’s residents. This year marks the 39th springtime community event. It is the largest “egg hunt” and will be attended by hundreds of excited children who will search for eggs in beautiful Central Park. There will also be a Pancake Breakfast, a parade with floats, a FREE Peter Rabbit’s Playground pre-school egg hunt for youngsters between the ages of one to three. The pre-school egg hunt also includes a Magic Show, complete with a professional magician. Friday, April 8 – 6:30 p.m. – 8:30 p.m. This is a family fun Friday night, which starts off with family group games and then shows the feature film. Refreshments and popcorn will be available. Anyone remember how fantastic the drive-in-movie theatre experience was? Yep, met too. Well, Family Fun Friday Night Movies is aiming to bring back that same experience, minus the cars. It’s the perfect opportunity to get your kids out of the house, enjoy a free community event and meet other like-minded families in the area. 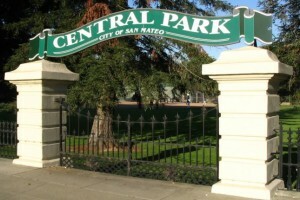 San Mateo maintains over 15 parks throughout the city. Many of these parks are equipped with community tennis and basketball courts, baseball diamonds, playgrounds and picnic sections with grills. Central Park is the main park and hosts several community events throughout the year. Complete with a Japanese tea garden, a mini train and a gorgeous rose garden. Joinville Park and Martin Luther King Jr. Park both feature swimming pools, while Ryder Park has a special water structure. On the San Francisco Bay, the Parkside Aquatic Park has beach swimming as well as sand volleyball available. This 670-acre county park is an perfect location for windsurfing, sailing, picnicking, an amazing walk or biking on well maintained trails along the ocean. Watch the waves and the wildlife and collect seashells while waling up and down the seashore. Coyote Point also has a boat harbor, a playground, golf course, volleyball court and a rifle and pistol range. It is also a great location for observing planes take off and land at the San Francisco International Airport. This children-friendly science museum with many hands-on activities and a small zoo featuring native animals is in the Coyote Point Recreation Area. It features large number of animals that were brought in from rehabilitation centers, a huge walk-through aviary, beautiful animal exhibits like the massive cave-like habitat for the sea otters. There are lots of structures for the children to play on both in an incredible playground and in the water park. There are tours and times you can watch the animals being fed and even adopt an animal to help CuriOdyssey in their mission to promote animal conservation all over the world. Ready to know more about San Mateo and all the beauty it has to offer? Relocating to the San Francisco area and desire a peaceful and relaxing lifestyle? Look no further than San Mateo. Contact Me if you want to know more about this one-of-a-kind city.